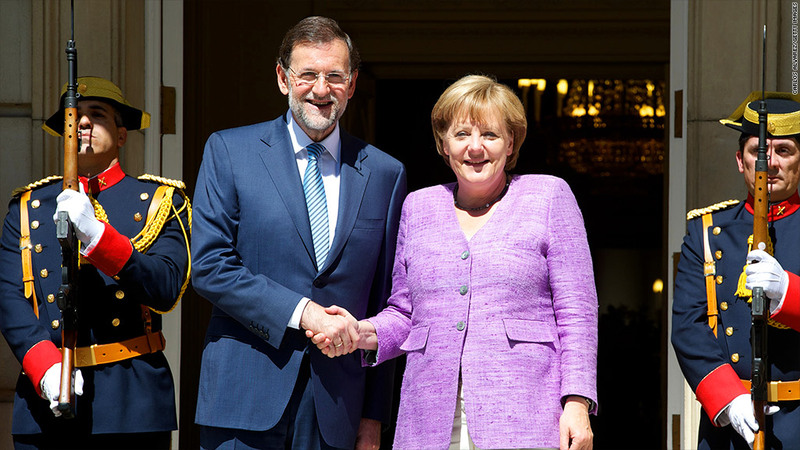 Spanish Prime Minister Mariano Rajoy and German Chancellor Angela Merkel are among European leaders set to meet this week at an EU summit in Brussels. European leaders will meet at an EU summit this week to work on closer ties between eurozone countries that are seen as critical to converting recent progress on fixing the region's debt crisis into a sustainable path to growth. The EU summit comes during a period of uneasy calm in global financial markets. Bond yields for troubled eurozone economies have declined significantly after the European Central Bank said in September it was ready to buy potentially unlimited amounts of sovereign debt. Despite signs of progress, investors remain nervous about Greece, where the government and its international creditors continue to negotiate over the latest installment of bailout money for the debt-stricken nation. Leaders will meet Thursday and Friday to discuss an interim report outlining steps to strengthen the eurozone, including proposed reforms of the banking sector and more integrated budget policies, according to a letter from European Council president Herman Van Rompuy. Spain has won relief from market pressure thanks to widespread expectations that it will request a formal bailout by seeking a credit line from the newly-activated European Stability Mechanism. This would allow the ECB to start buying its bonds. Moody's confirmed its investment grade rating on Spain this week, based on an assumption that Madrid will tap the ESM, and reflecting progress on fiscal and banking reform. But it assigned a negative outlook to the rating, underscoring the pressure on eurozone leaders to agree much closer integration. "Shocks at the euro area level could also have negative repercussions on Spain's rating, for example in the absence of concrete progress in reforming the euro area's fiscal, economic and regulatory institutions," the agency said. Analysts say Prime Minister Mariano Rajoy will wait at least until after regional elections on Oct. 21 before asking for help from his eurozone partners. A spokeswoman for the Spanish economy ministry told CNN the government was still considering its options. Observers say the likelihood of progress at this week's EU summit is low, following a more substantial agreement announced at the last summit. In a move hailed as a breakthrough, the leaders outlined plans in June to establish a central banking regulator and increase budgetary oversight. "Expectations are quite low," said Marie Diron, senior economic adviser at Ernst & Young in London. "If there was to be a significant agreement, we would normally hear about it in advance, but it's been very quiet on that front." While talks in Greece continue, EU leaders are expected to praise the government in Athens for making difficult reforms and taking steps to modernize the deeply depressed Greek economy. The Greek government is struggling to nail down all of the €11 billion of spending cuts it needs to satisfy the conditions of its bailout. Athens is also reportedly at odds with the IMF over the outlook for the economy and the likelihood it will achieve its deficit reduction targets. Greek Prime Minister Antonis Samaras is pushing for a two-year extension of the nation's bailout program, which the previous government agreed to in March. In a show of support, German Chancellor Angela Merkel met earlier this month with Samaras in Athens, suggesting that Berlin is softening its stance on Greece. "A political position has been reached to keep Greece in the eurozone," said Nicholas Spiro, director of London-based consultancy Spiro Sovereign Strategy. "But nothing is being done to secure Greece's future in the single currency area."